I recently bought a beautiful pair of glittery gold peep-toe wedges with a bow (only two inches high). It’s perfect for Christmas events, but I’d like to be able to wear it to work afterward since it’s such a comfortable height and I’d like to get more use out of it. The material is textured rather than actual glitter, so it shouldn’t be inappropriate. I figure my best bet with these shoes is to keep the rest of my outfit plain and simple and let them be the focus, but can you give me any more ideas and suggestions on how I could style glittery wedges for work? Thanks in advance, looking forward to your tips! P.S. To give you an idea of my usual work style, it’s quite feminine, ladylike and vintage-y, with occasional hippie-ish details. Think flowy skirts, pencil skirts, blouses, dresses, heels, florals and geometric prints. I rarely wear pants. My office does have a professional dress code but it’s not overly formal, as I work at an environmental management company – the restrictions are geared more at coverage and hemlines (eg. no sleeveless) than at clothing being structured or dark/neutral in colour. As a fan of anything and everything gold and glittery, I am so happy that you sent in this question! After all, everyone could use a little more sparkle in their lives, right? Of course, the trick to successfully incorporating glitter into your everyday look — and particularly into your everyday work look — is to keep everything balanced. That means, as you said in your letter, not going over the top with your outfit. However, that doesn’t mean that, in order to wear statement shoes, the rest of your look has to be boring, or even plain; in fact, adding a pop of color or some prints to your outfit can be the difference between a fabulous, put-together ensemble, and one in which your shoes simply look like an afterthought. Before we get to the glitter shoes outfits themselves, note that I couldn’t find a pair of shoes that were exactly as you described; so, I decided to go with these ones, which I’m sure give off a similar vibe and can be styled in the same way. Now, let’s get to the looks, shall we? To get the look, begin by pairing the shoes with a printed dress that has cute retro-inspired details, such as yellow enamel buttons, crochet trims, and a lovely bow at the neck. Next, add some eclectic jewelry: a pair of boho-chic dangly earrings, a dainty ring set, and an elegant charm bracelet. A swipe of deep burgundy liquid lipstick kicks the glam factor up a notch without going overboard (assuming that you keep the rest of your makeup look simple and neutral). Finally, a black quilted bag pulls this quirky-yet-classy look together. If you’re looking for something more neutral with subtler pops of color, then this is the look for you! Start by putting on a black floral-print peplum blouse. (Note that this one has a slit in the back, so, to make it fit your workplace’s dress code, it’s a good idea to layer a black camisole or tank top underneath, or wear a black blazer on top.) 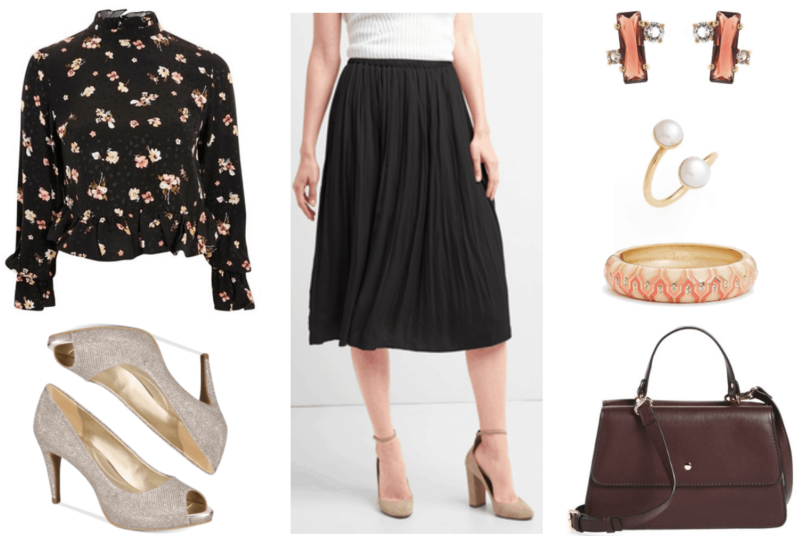 Next, put on a simple black pleated midi skirt. Add some unexpected jewelry, such as a pair of slightly asymmetrical stud earrings, an open pearl ring, and a geometric bangle. Pick up a sophisticated oxblood satchel, slip on your glittery shoes, and you’re all set to go! For the final look, I decided to put together something that is classic without being predictable or dull. First, put on an elegantly feminine tulip-hem dress. Then, add a simple light heather-gray cardigan to tone down the dress’ large floral print just a touch. Add a cute pair of bow stud earrings, as well as a subtly-sparkly pavé cuff bracelet and a boho moonstone choker. A minimal beige mini cross-body bag and the glittery shoes complete the look in a classy and stylish way. Note that this look could easily transition to evening; all you need to do is ditch the cardigan, swap the bag for a clutch in a similar color, and, if you’d like, add some bolder makeup. And there you have it; three beautifully chic, workplace-appropriate looks that incorporate glittery shoes! I hope you have fun experimenting with different ways to wear your shoes to work, and that these looks have provided you with some starting inspiration! Thanks for your question! Have you ever worn glittery shoes to work? Have you been incorporating holiday pieces into your everyday look? Which of these looks is your favorite?